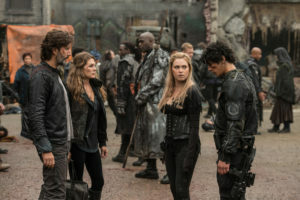 Late last year, KSiteTV was one of several media outlets to visit the Vancouver sets of the post-apocalyptic CW drama The 100, which sees its fourth season premiere tonight (February 1) at 9PM ET/PT. This season, the show even goes pre-apocalyptic if there is such a term, as it seems the world could end [again] in six months. 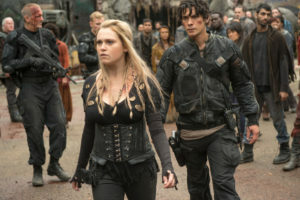 While on set we spoke with actress Eliza Taylor (Clarke) about where the show picks up. “We’re picking up directly where we left off from. We’ve obviously just discovered that the world’s gonna end, again, which is great,” she laughed. Telling everyone else about the danger that is facing them, however, will not be easy for Clarke. “It’s something that she has to be really careful about, because obviously she’s just taken all of these people out of this beautiful city where they were happy, and brought them back into a world that’s about to end. So, she has to be very careful about how she goes about telling people without starting a riot, basically,” Taylor explained. The fourth season of The 100 will see Taylor sharing scenes with some folks that Clarke hasn’t interacted with in a while, including Clarke’s mother, Paige Turco‘s Abby. “I live with Paige [Turco] and she’s one of my best friends, so it’s really nice to actually get to work with her again,” Eliza enthused. I think that Clarke and Abby’s dynamic is so interesting. There’s a lot of turbulence there, so getting to delve into that more is pretty awesome.” Clarke may have to look to Abby as more of an example as she takes a very active leadership role among Skaikru. “I think she’s definitely stepping up more and accepting herself as a leader, which is really great,” Taylor said. “It’s really fun to see that she’s asserting herself and not taking any stuff from people who don’t know as well as she does what’s going on.” This upgraded leadership role will also mean more scenes with Bellamy (Bob Morley).